1999 The 1999 FR500 Mustang was the first set of FR500 Ford Race cars based on the Mustang and in 1999 the SVT Cobra Mustang. In 1999, only three prototypes where built but set the stage for more to come in later years. Both the 4.6L and 5.0L V8s where started with, then a three-piece magnesium intake manifold was added along with C-pipe exhaust after the two mufflers, 4.10:1 rear gears, 18-inch billet magnesium wheels, and Brembo brakes. 2008 The 2008 Cobra Jet is an extensive options package designed by Ford Racing added to the V6 bodyline to create a track-only race car. The options package includes the 5.4L V8 with racing upgrades and optional supercharger, racing transmission, racing wheels and tires, racing suspension and handling, roll bars, all welded body seams, and tons more available from Ford Racing. The Cobra Jet is limited to 50 cars and are all white. 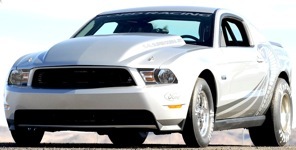 2010 The 2010 Mustang Cobra Jet is a limited run of 50, track-only, cars that follow are all white and built on the same production line that produces the 2010 Ford Mustang production car. Building on the track-only 2008 Mustang Cobra Jet, the 2010 version has new graphics, a choice between several 5.4L supercharged or normally aspirated V8 engines, adjustable front and rear shocks, manual steering and brakes, roll cage, competition shifter, Hoosier drag radials, Weld wheels, and a rear mounted battery with cut-off switch. 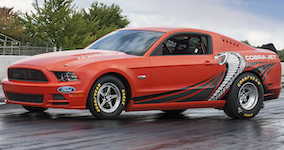 2012 The 2012 Cobra Jet FR500CJ returns in 2012 with changes that include a new aluminum-block 5.4-liter V8, a modified suspension, low-drag racing brakes, and new black anodized wheels. You can top the engine off with either the 2.3-liter TVS supercharger or the 4.0-liter Ford Racing Whipple supercharger. Both yield a 425hp engine. And can push the car to under 10 second quarter mile time! A quantity of 50 units were built and were available in Race Red, Grabber Blue, and Winner White paint color. The graphics on the sides are options. 2013 The 2013 Cobra Jet sports the newly designed hood, grille and rear end and lots of performance features from Ford Racing. The new styling saves 200 pounds and this combined with two supercharger options will make it more powerful than the 2012 version. Stay tuned for more information. 2014 The 2014 Cobra Jet follows the specification of the 2013 Cobra Jet with a Whipple 2.9L supercharged 5.0L V8. Base price begins at $97,000 and limited to 50 vehicles. Three exterior colors available are Gotta Have-It Green, Flat Black, and White. 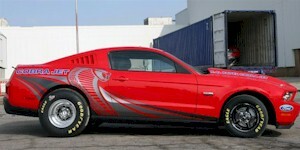 One Race Red Cobra Jet was auctioned to benefit the National Multiple Sclerosis Society. 2016 The 2016 Cobra Jet is limited to 50 with exterior paint colors of Deep Impact Blue or Oxford White. They are designed off the new 2016 Mustang V6 body with unique flared fenders, parachute, and Hoosier tires. The engine features a 5.0L V8 with 92.2mm bore, 92.7mm stroke, 9.5:1 compression ratio, 2.9L Whipple front-entry supercharger, forged steel crankshaft and a whole lot more. Horsepower is estimated a 707. 2018 The 2018 Mustang Cobra commemorates 50 years since the first Cobra Jet in 1968. 68 specially prepared, non-street legal, track-only, Mustang Cobra Jet race cars are available in either Oxford White or Race Red. Under the hood is a special version of the 5.2L Coyote V8 with a 3.0L Whipple supercharger, 9-inch solid rear axle, two-way coil-over shocks with adjustable ride height, low-drag Strange Engineering brake system, four-link rear suspension with antiroll and pan bars, NHRA-certified safety roll cage, FIA-certified seats, anniversary-badged racing wheels, and optional 50th anniversary graphics and badges.